Your window into enjoying the beautiful spring and summer weather in the Batavia area is through your patio. With a few small patio ideas, you can come up with a location right outside your door that is ideal for a backyard retreat. Your patio is ideally a place that you and your family and friends can spend a lot of time in the warmer months. A few small patio ideas can make all the difference in the world, in the quality of your surroundings. It can make your backyard more enjoyable for your immediate family, or a place that your family and friends will be happy to return. 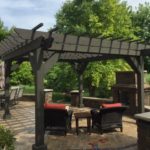 Now is the perfect time to start considering some of the enhancements you would like to make to your backyard, or patio to turn it into a desirable place for you and your family to spend time. Below are a few small patio ideas to get you started. Pavers offer a great way to come up with a unique design that will fit your patio. Both Belgard and Unilock produce a quality paver that is durable, and offers a timeless look for your backyard. 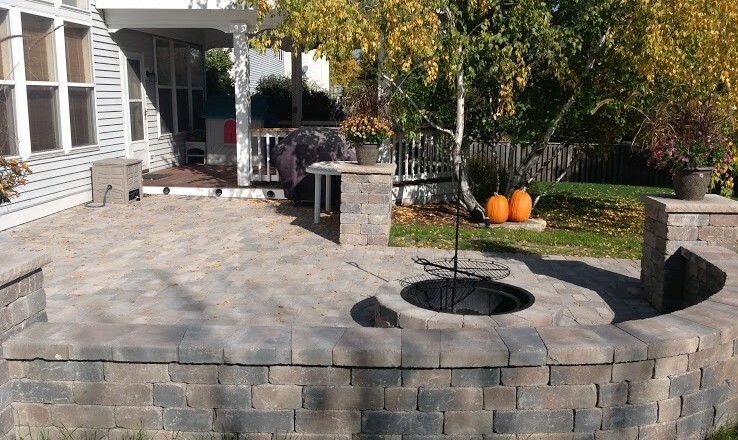 Pavers can last a long time with very little wear in the harsher winter months. These are great building materials to make sure you get a patio you will be happy with for many years to come. A built in fire pit is a great way to achieve a level of notable elegance when it comes to your patio. It can become a centerpiece on an evening when your friends and family come to talk. These fire pits become a feature that draws your guests in, versus a small contraption wheeled out when you have company. A built in fire pit is something everyone will end up loving. Do you want something that truly makes your patio different? Do you want something to truly highlight the beauty of your outdoor living space? A small water feature on or near the patio might do the trick perfectly. Spillway bowls and bubbling urns for example can draw out the beauty of your backyard. If you have a rail around your patio, it might be a good idea to build in a planter. This can draw the beauty of the garden that much closer to your outdoor guests, giving them a closer proximity to appreciate nature. Softscapes and native plantings can be a great way to enhance your outdoor living area. While it doesn’t have anything directly to do with your patio, a pond is a great way to enhance your outdoor living area. It can give you the perfect slice of nature to appreciate while you spend time on your patio. A few small patio ideas can breath a new life into your backyard. Do you want to explore what possibilities might exist for your outdoor living space? Contact a professional landscaper in the Batavia area today.